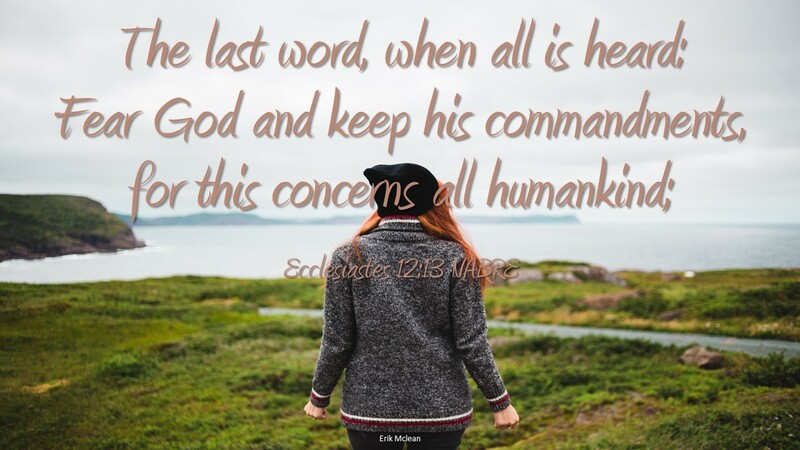 Ecclesiastes is a wisdom book, the proverbs and counsels of the book come from a wise man’s experience; are incisive, realistic, loaded with common sense and always useful. The wise man author calls himself Preacher. Some of what is said in the book can be a little disconcerting, due to the thought that some of its wisdom is derived from pagan wisdom and it is not always clear when the Preacher is using it as irony. But as we see in the quoted verse, which is also the closing verse; when all has been heard: Fear God and keep his commandments. The word fear does not mean be afraid, rather biblically speaking fear is used to exhort us to respect God, to see God with a certain awe and know the awesome power of God. Therefore respecting God and keeping His commandments are the best wisdom and advice for the best life. The verse continues; this concerns everyone. If all the world will respect God and follow his teachings we all will be able to live the best, most fulfilled and happy life. Including everyone makes the entire world a happy place. The book ends with the wise man saying essentially, I have done the best I can to create many wise sayings that I am sharing with everyone. But as the last word remember it is God’s word that is the wisest and most appropriate to follow. Do you respect God and know his teachings? If we and others follow, we can turn pleasure seeking into happiness. We have an appetite for certain things, when those things are self-serving we can never be satisfied. Disciples seek a higher purpose and receive from God satisfaction. God’s satisfaction leads to happiness. Meditate on the difference between pleasure and happiness? Is your respect for God a daily priority?